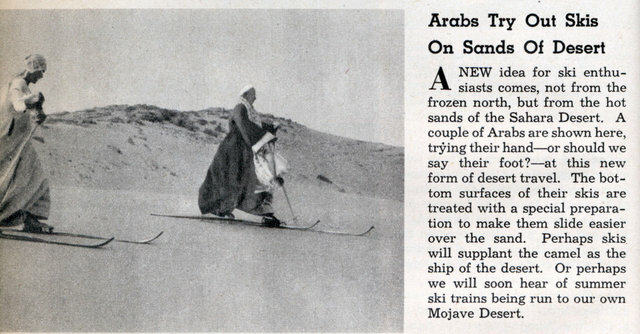 ANEW idea for ski enthusiasts comes, not from the frozen north, but from the hot sands of the Sahara Desert. A couple of Arabs are shown here, trying their handâ€”or should we say their foot?â€”at this new form of desert travel. The bottom surfaces of their skis are treated with a special preparation to make them slide easier over the sand. Perhaps skis will supplant the camel as the ship of the desert. Or perhaps we will soon hear of summer ski trains being run to our own Mojave Desert. or perhaps we’ll hear ‘death to america’ very soon….